A huge unexploded bomb, left over from a long dead civilisation and ignored by all town residents, because it is town custom to ignore it, is detonated by one who follows the "How to detonate this bomb and totally destroy the entire town and all its occupants" instructions printed clearly, in big helpful lettering, on the device's side. In the devastating blast almost the whole town is torn from the map. "It probably would have been wiser to get rid of such a dangerous item really but it was the tradition to give Ole 'Divine Retribution' a customary little rub or pat as we went into worship. Nobody ever thought anybody would be mad enough to actually follow the instructions written on the side!" Cops take her away in handcuffs on a charge of criminal negligence. "While the court accepts your whole town sanctioned, by their individual inaction, this unconscionably irresponsible practise, you are the only remaining former resident and as such are culpable, under the law of Joint Enterprise, for the mass homicide, which ensued. For your part then, in the town's residents utter failure to remove or even make safe such a potentially cataclysmic item and for the incompetence of leaving such potentially devastating commands in clear sight, where any old unstable nutter or curious child could easily obey them on a whim and destroy so much, you are sentenced to death. However, as you're a pretender in the same god as me, I want you to sit and think about what your inaction enabled." Can you see how it's clearly not allegorical? In the King James version of the Bible is a verse that tears the 'immortal soul' from every believer's belief system. And it's not in some obscure mouldy old tome in the locked and secret, shhh, Vatican archives, it's as clear as day for anyone really reading to see. And you don't have to read far either; it's right there up the front! 22 And God said, Humans were never supposed to become like me, with the power to discern good from evil; they were supposed to remain my playthings, gamboling like puppies, but now they have that power! Grrr; I didn't see that coming!! Curse my lack of omniscience! Now one day they'll be able to figure out my actions here are wholly immoral, verging on unconscionable evil! The last thing I need is for 'em to be chasing me around the cosmos looking for justice forever! Hey, you two disappointments! Get out! And don't eat from that immortality tree on the way out neither! 23 And so, learning the lesson the young learn young, 'never trust anyone over 30', the disappointments left, mortal but wiser than the god who fashioned them. As Humans were banished specifically to avoid them becoming immortal is unarguable, immortality was not an original design feature of humans. If there is one single mental component which engenders the belief that one has, or is in possession of, humanity's longest held zeitgeist the 'immortal soul' it is a person's ego. Only via egotistical thinking can one conclude human consciousness(the 'person'/'self') is not engendered by the biology in which it manifests but instead is somehow independent thereof and can therefore continue to exist, intact, indefinitely and independent of the only location ever known for that 'person', its functioning biology. While it's likely, after centuries of "slaughter the unbeliever" and elevated breeding levels among the doctrinally oppressed, some are born with an 'Id' that's genetically predisposed to believe the 'immortal soul' notion, I think one may suggest that the presence of such among the population is born of the existence of the egotistical notion triggering epigenetic changes over time. Could one suggest then that it's the presence of Ego alone that engenders the ready acceptance of eternal life fantasies? I think so; here's why. I, one of the soulless, an unbeliever, consider the "I" that is me to be the current culmination of this biochemical genetic colony's life experiences and its current chemical state. The "I" that is me "exists"(has power in the cosmos) for only 1/40th of a second1, then is gone, lost forever, an imprint on the chronology of the cosmos. And is instantly replaced by a new version of "I" with 1/40th of a second more experience2, a new chemical state and responsibility for all this colony's prior acts. When, after a lifetime of about 100 trillion conscious moments, this genetic colony finally fails beyond the capacity for internal or external maintenance or repair, there will be one final "I" before the consecutive stream of "I's" that made up the "me" can no longer be generated. The memory of that recorded "me", who imprinted on the shape of the cosmos for the merest blink of the cosmological timescale, lingers in the consciousness of all or a portion of society then diminishes over a period of time relating roughly to the recorded accomplishments. For the "I" that is "me" the "I" does not extend beyond the single conscious moment and the recorded "me" cannot exist beyond the means which engendered it. You, one of the soulful, a believer, consider the "I" that is you to be an eternal entity, able to live beyond the biochemistry, extending from before conception, way beyond the single moment and long past the death of the genetic colony stretching on into an distant, possibly unending, future. An "I" of such importance the cosmos will not allow it to expire. Which "I" has the bigger Ego? 2 "1/40th of a second more experience" : The nature and depth of the experience available in this time period is determined by the complexity of the "I" experiencing the moment. For more on this see Conscious Of Consciousness. 1.1 Psychoanalysis - The part of the mind that mediates between the conscious and the unconscious and is responsible for reality testing and a sense of personal identity. Compare with id and superego. for that which currently exists, to exist. things not known or knowable. Hope is a symptom of sentience in the presence of ignorance. A defencive pretence in the absence of knowledge. spawning prospecting premises from which to proceed. impossibly disconnected from the impending incidence of the causal chain. An against-all-odds simulation, anticipated in the absence of true solace. for that font of all false to truly be true? Atheism: The lack of belief in a god or gods. What are you talking about? A god? What's that? Eh? Are you drunk? Sounds like you've imagined it! To silently disbelieve unwarranted, unnecessary & unsubstantiated supernatural claims. To passively not believe all unsubstantiated claims for god or gods. The belief that whomever promotes claims for the existence of god or gods should substantiate those claims. To converse with whomever promotes supernatural fables as true and persuade them to simply admit there is no legitimate reason to promote unsubstantiated conjecture as fact. And that those of us too honest to do so, do not vomit projectile ectoplasm while our heads spin around. Discourse associated with no.5 may only be achieved where the atheist makes points to illustrate how facets of faith have been misjudged. The religiously indoctrinated often intuit the points made in such debates to be a set of commandments or principles in which the atheist believes (has faith). Debater A has a doctrine of instructions, commandments etc; a seemingly cohesive structure of concepts from which to argue her doctrine's position. Debater B has no doctrine and so the debate may only proceed by way of presentation of each concept raised in Debater A's doctrine. As the debate moves forward each point in the Debater A's doctrine is countered by Debater B (Whether or not these are won or conceded by either side, a posit of similar validity is made.) and by the end of the debate each point of doctrine has two explanations, the original doctrinal explanation presented by Debater A and the new alternative explanations to the doctrinal concepts presented by Debater B.
Debater A is confused as to why there even are alternatives, why her 'beloved' doctrine has not won hands-down; "it's the work of a god after all". Undeterred, however, she moves on to debate with Debater C, who also has no doctrine. This time, when the debate was over, Debater A noticed the concepts offered as alternatives to the key points of her doctrine were almost exactly same set of concepts offered by Debater B. Debater A concludes "Debaters B and C must be following a doctrine of their own! My doctrine details that Good-guy-gramps has a supernatural archenemy with sneaky and bad, naughty, naughty ways; their apparently cohesive doctrine must be an Evil product thereof! Oooooh Spooky!" 1. Doctrines remain unchanging so the same arguments will be repeatedly offered in opposition to doctrinal concepts, in every debate. 2. Many of the concepts for which her doctrine makes claims have actual, verifiable, real-world answers, which wholly differ from doctrinal claims and which cannot be overlooked as alternatives to doctrinal claims because they are facts. 3. All doctrines makes a set of claims. In any debate the set of responses countering those doctrinal claims will be perceived, by those taught to perceive everything via a religious framework, as a cohesive doctrine, structured similarly to their own doctrine's religious framework, but this is an illusion born of circumstance. 4. In the absence of a religious doctrine to set a framework, the set of concepts presented to counter that religious framework are not perceived of as a "set" but are merely an unconnected subset of all known concepts/data/knowledge. Only when perceived through religiously tainted eyes do a subset of concepts look like a religion. The religionists misapprehension "atheism is a religion" is born solely of the presence of their own religious framework. Is the religionists disability of reasoning on this point, in and of itself, clear enough evidence of the terribly insidious influence over followers' honesty and thereby wider society these spurious tomes have? 1 If Debater A were to accept that "immortal soul" is not fact but pretence she would be able to recover full reasoning capacities. Only they feel obligated, by family, friend and social group's custom, culture or tradition, to practise the usually misogynistic and paternally prescribed family faith. Only they feel obliged, by others who have been similarly indentured, to comply with the dogma's imposed compulsions, the pillars, if you will, of the tradition, the subjugation and enslavement of the self to the compulsions the dogma dictates; the imposed prostrations and recitations for supplicants. Only they, in this haze of normalised oppression, feel the compulsion to spread these toxic tenets, as dictated by the author in this coercive manifesto. Only they will be implored, bribed and coerced, by elders and "betters" to "conduct yourself properly in the superior ways, as prescribed for us in our unquestionably glorious supreme leader's unquestionably supreme manifesto". Only they feel compelled to close or open their legs at the times the diktats prescribe. 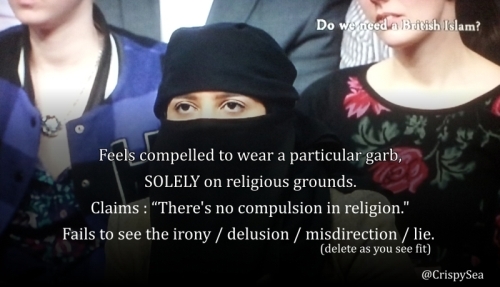 Only they feel the compulsion to wear the uniform, the scripturally 'commended' religious garb and bling; always aware of the mantra "Purest Piety wins the Prize". Only they feel the indoctrinated urge to coerce the still free, those not yet obligated to the 'supreme' path, to feel compelled to concede that ONLY this manifesto of coercive diktats, compelling submission to an unproven authority, is supreme above all, and other manifestos, which may seem to claim similarly are inferior counterfeits. Only they are compelled to believe these "counterfeits" to be the works of demons and those who seek every opportunity to destroy the supreme path set forth by the supreme leader. Only they fail to notice "there is no compulsion in religion" is a verse born of the doctrinal source of all their spiritual compulsions! And all, and only, because a manifesto of spurious compulsions, which they were compelled to concede as true, has compelled them, via its coercions, to accept and promote what it compels! And we, the un-shepherded, who are not they, know this because we have no doctrine and so none of the procedural compulsions to which the totalitarian manifestos compel their despairingly enormous flocks. With compulsion being the foundation and scaffolding around which faiths are built, how can anybody who does not notice any of it, to the extent that they can feel comfortable and truthful proclaiming "there is no compulsion in religion" be trusted to even use a spoon without injury? It's NOT funny coz it's true. Below is the content of a letter I have just posted to my Member of Parliament. I am writing with reference to the Counter extremism, Home affairs committee's interview of Fazal Dad, Senior Imam, Abu Bakr Mosque, Bradford, on 12th January. "Maybe it would be helpful if you'd explain how these ideas differ from the faith that you practise in your mosque." "The Qur'an tells us straight away... 'Min qatala l-nasa', the person who kills any person it is as though this person has killed humanity, and the person who saves one single person it is as though this person has saved humanity"
"On that account: We ordained for the Children of Israel that if anyone slew a person - unless it be in retaliation for murder or for spreading mischief in the land - it would be as if he slew all mankind: and if anyone saved a life, it would be as if he saved the life of all humanity." The deceptive omissions he and all "moderate" Muslims make, change the verse, making it sound as if the verse applies to Muslims, it does not; it's a passage referring to long-dead Israelites. However, no matter who the believer thinks it refers to, Muslims or Israelites, it is not the Buddha-like message of peace Muslims paint it to be, but instead has caveats and clauses for those who may be 'righteously' slaughtered. An extremist would argue that "the land" mentioned refers to "all lands owned by Allah" or as we know it the world, and that "spreading mischief" refers to anyone not conforming to Allah's wishes, or as we know them, non-Muslims, which, as you can see, clearly moves the meaning of the verse into one which legitimises the slaughter of any/all non-Muslims. Why did the counter extremism committee allow Fazal Dad to repeat this misleading quote from his scripture without challenge? All I hear from western leaders is how peaceful Islam is; has nobody actually read the Qur'an? Are ALL western leaders simply relying on Muslim advisers? I have no idea how any properly adjusted human can read the Qur'an and not find it wholly offensive, both on a human rights level and a legal level and I'm deeply concerned at the apparent complete lack of comprehension about the true nature of this religion being fraudulently promoted as peaceful by those who are paid to keep us safe. I understand the committee will be recalling Fazal Dad, would it be possible to request he recite the full verse, in English, with all the wording, then explain why he and so many Muslims conceal the true verse behind the misleading, edited version? Please pass this letter to a committee member and the chair. Have western leaders been too lazy to be offended by the contents themselves, relying solely on "trusted" Islamic advisers? Or is there a great conspiracy, spread far and wide, to conceal the absence of a message of peace in this "message of peace"? And, if that is the case, how can any intelligent human become convinced that peace via conspiracy is achievable? Is it just me, or does it sound like a perfect recipe for conflict and civil war to anyone else?